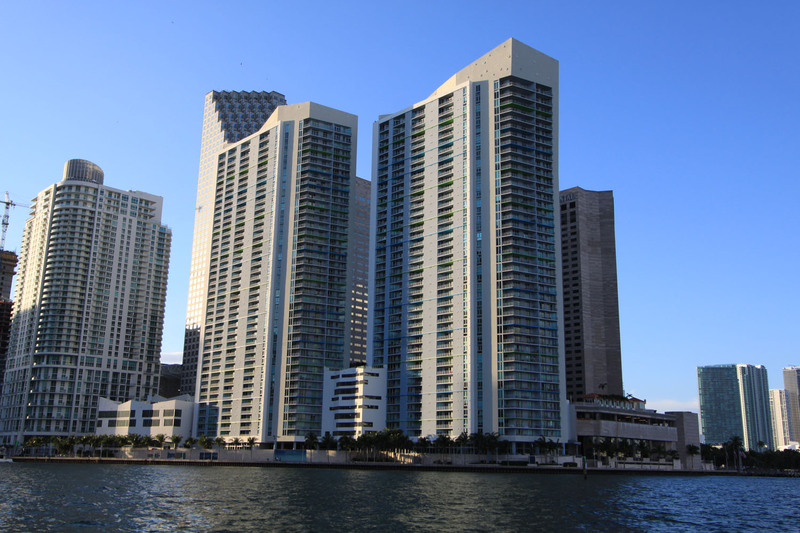 One Miami is a pair of buildings by the architectural firm of Arquitectonica, both standing 44 stories tall overlooking the Miami River and identifiable by the blue strips running vertically across both buildings. 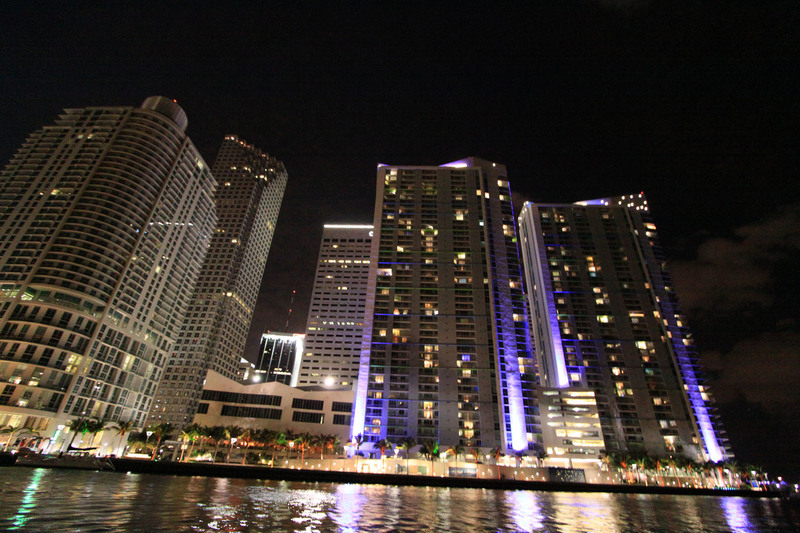 Residents of these buildings enjoy views of the river, the Miami cityscape as well as Biscayne Bay to the east of the building. Floor plans range between 507 to 3,208 square feet. At One Miami you’ll find a riverfront café offering casual and al fresco dining, a state-of-the-art fitness facility, a full service business center and multifunction rooms in both of the One Miami condos. Outside, lap and recreational pools are complemented by tropical landscaping and party decks with views of the waterfront plus tennis courts. All this comes with valet and security, concierge, housekeeping and dry cleaning services. 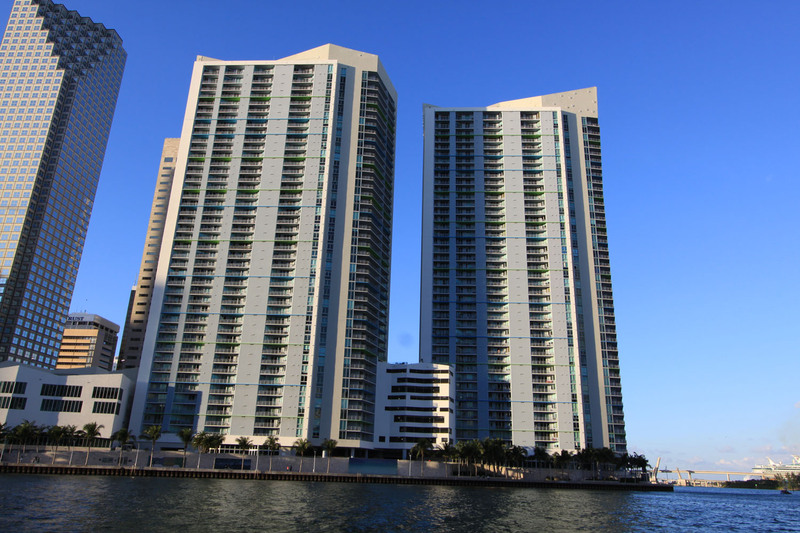 A The one, two and three bedroom Miami condos for sale within the buildings have Smart Building technology and private balconies. Kitchens feature European style cabinetry, imported granite countertops and stainless steel appliances. Look for deluxe imported tile flooring within the bathrooms. There are parks, shopping, restaurants and much more to explore near One Miami. To the east is the Bayside Marketplace and Bayfront Park, the former features waterfront dining and shopping while the latter plays host to various festivals. Mary Brickell Village to the southeast has plenty of bars and restaurants plus a convenient Publix supermarket. If you take I-395 eastward, you'll eventually reach the barrier island of Miami Beach, home to Lincoln Road and Ocean Drive.